Gov. Jim Justice announces the adjutant general of the West Virginia National Guard, Maj. Gen. James Hoyer (center), will take over operations of the RISE West Virginia flood recovery program, Monday. CHARLESTON, W.Va. — Gov. 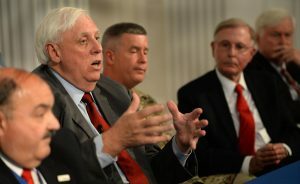 Jim Justice said Monday a stagnated $150 million federal flood recovery effort to help those victimized almost two years ago will begin again under new leadership. The Monday news conference ranged from a sweeping indictment of the Commerce Department and its handling of RISE, to a mea culpa for repeatedly denying or ignoring media requests to the Governor’s Office on the matter, to adamant statements that Justice himself is not to be blamed for the problems associated with recovery efforts.